Cryogonal's official artwork from Pokémon Black and White. Cryogonal (フリージオ, Frigeo) is a Pokémon. 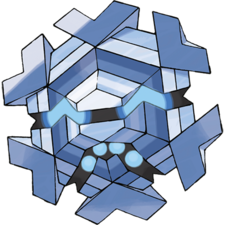 Cryogonal is an Ice-type Pokémon introduced in Generation V, and is categorized within the Pokédex at #615 as the "Crystallizing Pokémon". It has no evolutionary relatives and it is very rare, only found in icy areas. Ice Beam is a special Ice-type move introduced in Generation I. It has 90 base power (95 before Generation VI), 100% accuracy and a 10% chance of freezing its target. Cryogonal learns it naturally at level 33, and, like most other Ice-type Pokémon, can also learn it with TM13. Cryogonal appears as an enemy. It hovers in the air and attacks fighters in proximity with a long, straight Ice Beam which freezes its target. The direction of the Ice Beam can either be kept fixed or be rotated to follow the player. Cryogonal trophy in for 3DS. This ice-type Pokémon uses its ice crystal chains to capture and freeze its prey to -100 degrees. In Smash Run, it drifts through the air and attacks fighters using Ice Beam. The attack comes in two forms: it will either fire in one direction, or it'll rotate as it fires. Don't let it hit you or you'll end up frozen solid! This page was last edited on April 5, 2019, at 16:29.